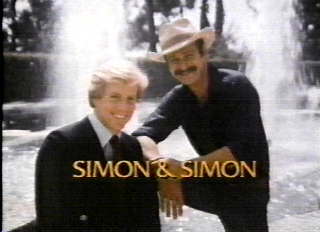 If you had a thing for those different-as-day-and-night private investigators Rick and A.J. Simon, you're not alone. Although they're not on television anymore, there are many fabulous websites if you find yourself in the throes of eighties nostalgia. "The critical consensus seems to be that 'The A-Team' is unadulterated garbage of a particularly pernicious kind." Description of the show supposedly from a memo from Brandon Tartikoff to Stephen J. Cannell: "Road Warrior. Magnificent Seven. Dirty Dozen. 'Mission Impossible.' All rolled into one. And Mr. T drives the car"
One of my fondest memories of growing up was watching shows like the A-Team with my Dad. We would tune in to see how many jeeps would fly through the air, what incredible machines the team would build with pieces of junk and only a few minutes left on the clock, and we would quote the expected lines as they came along: "I love it when a plan comes together"; "Nice, B.A.! "; "It's Decker! "; "I've got you this time, Smith." Even though it may be formulaic and it's definitely dated, the show still makes me feel that 11-year-old's sense of joy at the spectacular silliness of it all.